Father and son owners, Bruce (left) and JB McCollum, accept the award on Tingley's behalf. PISCATAWAY, N.J.—Tingley Rubber Corp. was awarded top honors at the 26th Annual New Jersey Family Business of the Year Award Luncheon. 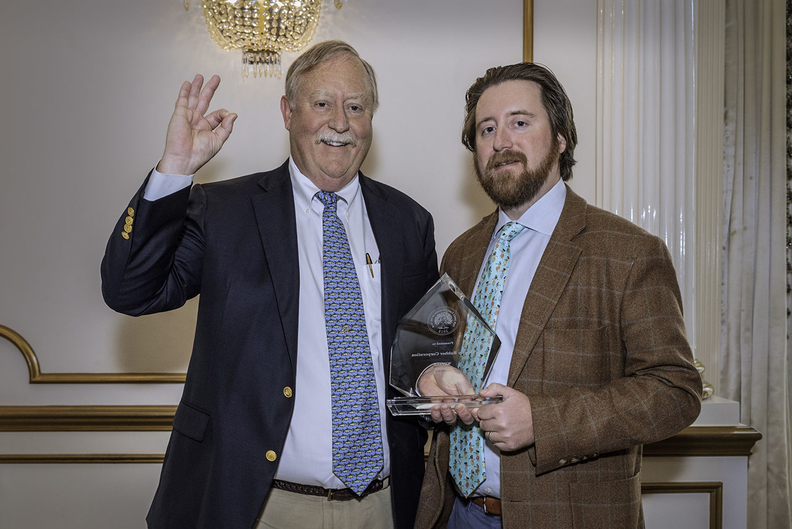 Father and son owners, Bruce and J.B. McCollum, accepted the award at the luncheon Oct. 24 at the Crystal Plaza in Livingston, N.J., according to a Tingley news release. Tingley was named the award-winning family business of the year, in the category of sales $10 million and over. The event has a second category for family businesses with sales under $10 million. The 122-year-old, fifth-generation-owned business, manufacturers protective footwear and clothing, and is headquartered in Piscataway. In the history of the award program, it has nominated and recognized 1,071 companies, honored 251 semi-finalists, 130 finalists and 54 category winners, and generated event proceeds that are applied toward entrepreneurial scholarships at Fairleigh Dickinson University. To date, $150,000 has been raised toward the scholarship fund.